The micronucleus of Paramecium caudatum is distinctive from other closely related Paramecium such as P. multimicronucleatum and P. tetraurela. P. caudatum has only one micronucleus of a type in which the chromatin is spread equally throughout the nucleus as opposed to P. multimicronucleatum which has four very small micronuclei of the vesicular type and P. aurelia which has two micronuclei of the vesicular type where the chromatin forms a central electron opaque mass in the center of the nucleus. 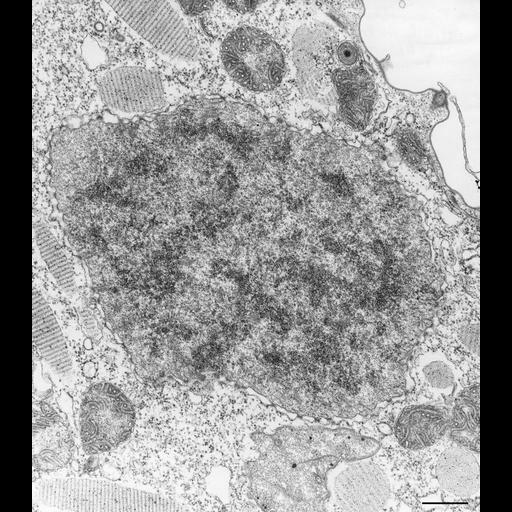 The micronucleus in this micrograph contains many microtubules so it may be in early division. The nuclear envelope has many nuclear pores. TEM taken on 3/23/73 by R. Allen with Hitachi HU11A operating at 75kV. Neg. 13,250X. Bar = 0.5µm. Standard glutaraldehyde fixation followed by osmium tetroxide, dehydrated in alcohol and embedded in an epoxy resin. Microtome sections prepared at approximately 75nm thickness. The negative was printed to paper and the image was scanned to Photoshop. This digitized image is available for qualitative analysis. There is a high resolution version of this image in the library (CIL:39204) which is available for quantitative analysis. Additional information available at (http://www5.pbrc.hawaii.edu/allen/).